While Greg and I were growing up, a common site in the back of the family refrigerator was a jar full of seeds, often beans. Our parents and grandparents saved seeds from each year’s harvest in order to plant next year’s garden. Families passed them down through the generations and traded them with friends and neighbors to grow their collection of varieties. These agricultural anthologies were valuable guarantees of personal wealth and sustainability. Food was grown and regrown at no cost, year after year, if the proper steps were taken. Because they were open-pollinated (propogated by natural means: birds, wind, etc), these seeds could be grown again and again to produce the same historic variety. Richly-diverse, heirloom seeds yield a wide array of colorful crops (ie: purple potatoes and carrots, yellow and pink tomatoes, or strawberry popcorn). In the latter part of the 20th century, the practice of “food science” led to the development of many “convenience” products. Hybrid seeds were developed in laboratories to increase yield, and agribusiness replaced the family farm. Why grow it if you could buy it cheap? And if you still wanted to garden, why work hard to save seeds if you could buy new ones each year? The problems with hybrid seeds are many and often misunderstood. 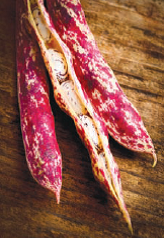 Borlotti Bean, a variety of cranberry bean bred in Italy to have a thicker skin. Also known as French horticul-tural beans, they have an appealing sweet mild, some-times nutty flavor and are the heart of many northern Italian dishes. Original cultivated in Colombia. They cannot be saved and grown again. This ensures that consumers will have to purchase more product every year, much like light bulbs (the original Edison light bulb is still burning). Big business keeps making lots of money. Hybrid seeds are also genetically-modified and contain built-in pesticides. These chemicals enter our soil, and penetrate our water table. We ingest these poisons by eating their crops and living in contaminated environments. Biodiversity disappears and nature’s ability to fight disease or pestilence dies with it, much like genocide. Heirloom varieties are more flavorful and richer in nutrients. Try a taste-testing this summer at your local farmer’s market! Cuts down on wasteful use of fossil fuels: consider the transportation costs of hybrid seeds as well as produce delivery. Organic, locally-grown foods are available without mass transit costs. There are many resources for getting your own heirloom seed collection started. Our favorite is Seed Savers Exchange, a nonprofit organization in Iowa. They have great prices and an extensive historical catalog. To learn more about the anti-Monsato, non-GMO seed debate right here in Pennsylvania (or to locate local farms), contact the PA Association for Sustainable Agriculture: http://www.pasaframing.org/(412) 365-2985. There’s much more to come about Farmers Markets in our May issue, and this fall we will talk about saving your seeds to start your own family heirloom collection. By megan1903 in Columns, Down on the Farm, Feature Stories on April 26, 2014 .